Happy Sunday! I hope everyone is enjoying their weekend. :) I spent most of my day yesterday working on my newest product, and I'm so excited it to share it with you and my kiddos. Make sure you read the post to the end for chance to win your own copy! One of my goals for my kiddos is to improve their fluency scores. A good chunk of my class was below benchmark after testing in August. So I've been looking for ways to sneak in extra fluency instruction and practice any way I can throughout our day. I'll be sharing how fluency is practiced as a center and as homework later this week, but one of my kiddos favorite ways to practice fluency is through games. They absolutely loved my Trick or Treat Sight Word Game. So I took that and ran with it for a November game for my kids, this time I used fry phrases for the 3rd, 4th, and 5th One Hundred Fry Words. The game follows the same rules as Trick or Treat, a kiddo picks up a fry phrase card and if they can read it, they get to keep it. If they can't they put the card back and their turn is over. However, if they pick a Gobble Gobble or Wobble Wobble card they have a chance to either gain more cards OR loose some or ALL of their cards. My kids LOVE getting those cards. The winner is whoever has the most cards when time is up. I play a few rounds as a class to introduce the new game and then I make it available as a station for my kiddos during our RTI intervention time (a ten to fifteen minute part of our day where some kiddos are pulled for interventions and we can't do any type of brand new instruction). 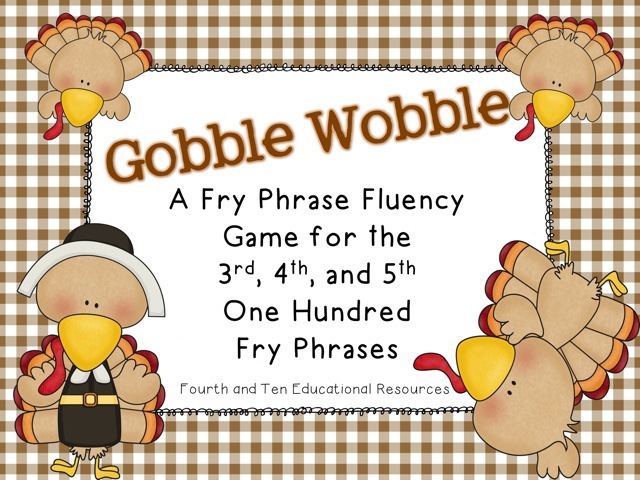 Games like Trick or Treat or Gobble Wobble are so popular, that I have to make two. :) I also have small groups play it with my parent helpers as well. I have uploaded Gobble Wobble to my Teachers Pay Teachers store. It's on sale until Monday night. Click on the little cheerleader below to check it out! 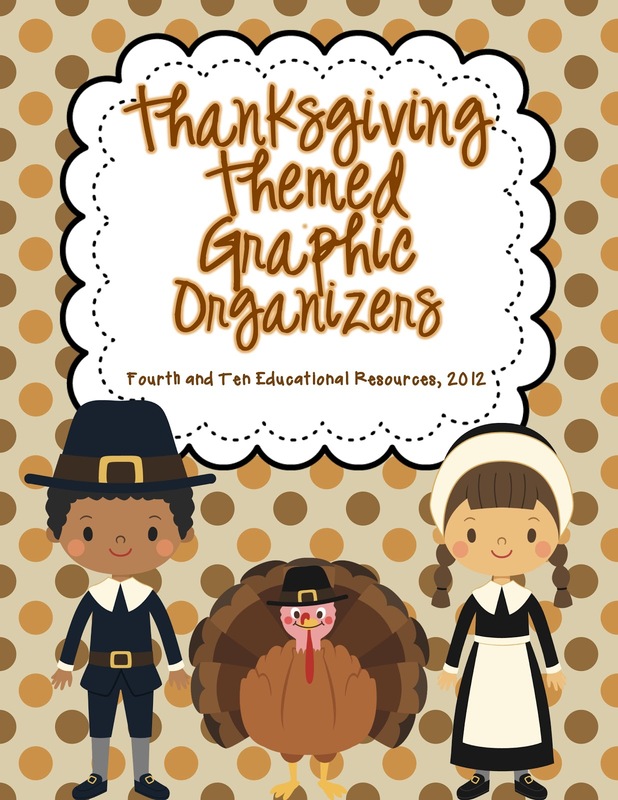 Many have asked if I have made Thanksgiving Themed Graphic Organizers like my Halloween themed ones. I sure have. :) I'll blog more about them later, but they are up. :) I got my Thanksgiving books out the other day and my kids were so excited! As a reward for following along with this post, I'll be giving away a copy of Gobble Wobble to a lucky follower! Whoever can guess my Thanksgiving side dish wins their very own copy! Good luck! 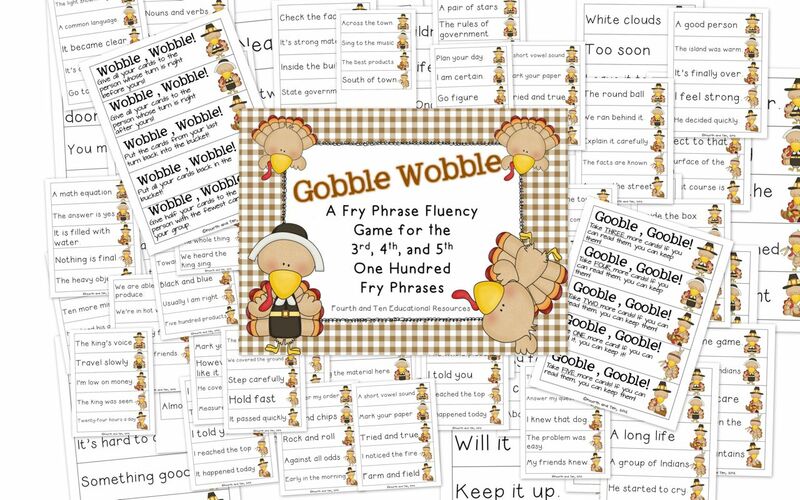 The "Gobble Wobble" fluency game looks great! How fun:) I am going to guess that you favorite side dish is sweet potatoes! I'm loving those graphic organizers! Hmmmm....how about green bean casserole?!?! My class has also been struggling with fluency and the need to practice sight words (I'm also 4th grade.) I tell them that we need to practice to help our 1st grade reading buddies. What a great way to practice fluency! My class loves using your holiday graphic organizers and are looking forward to November's math centers. My guess would be macaroni and cheese. Green Bean Casserole? that is always what I bring... can't wait for all the good food! I will go with a cranberry side. (Hopefully one with real berries!) I make one with a whole orange and ginger...yummy! How fun! Looks great as always! :) I am going to guess...mashed potatoes and gravy?